For the next thirty days, I’ll be living a very spiritual, upscale life at the Healing & Meditation Center, Paz y Luz (Peace & light), in the small town of Pisac, Peru. Yesterday, I taxied from Cusco over hairpin-turn, single-lane highways through the breathtaking Andes Mountains, descending in elevation to a green, river valley cloistering a lovely, red-roofed, adobe settlement. This town is most unusual because it’s almost like a compact barracks with street/sidewalks or sidewalk/streets intersecting….. four blocks by four blocks. 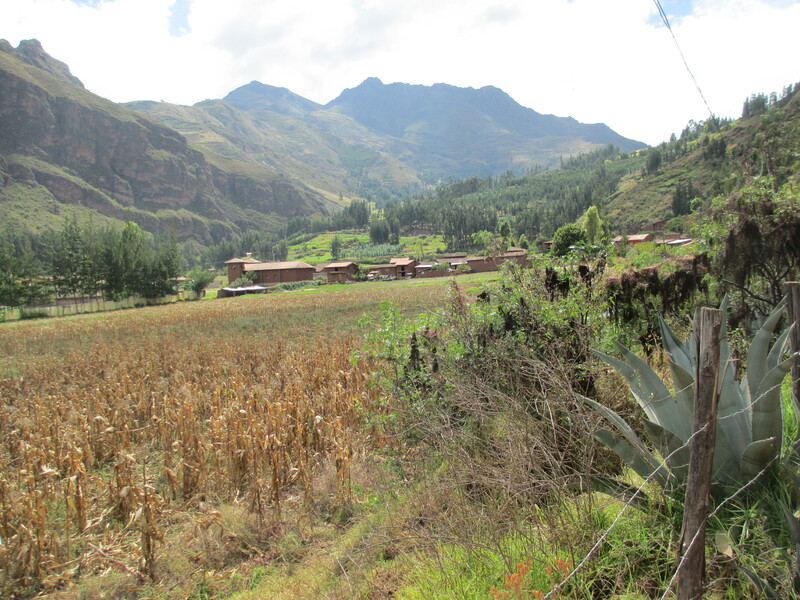 If every shop and entry yard were closed, there would be nothing but flat walls and wooden doors and Pisac would merely amount to a stone labyrinth. But, when the town is open for business, colorful displays and gentle hawkers lure you into their tiny, colorful shops, bursting with art and artifacts; as well as the normal hardware and haberdashery of life. 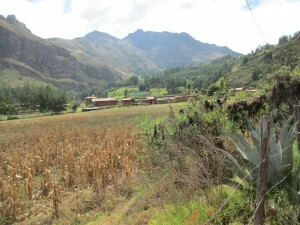 Organic restaurants and health food stores specialize in Peru’s ancient use of plant medicine. The main grocery store serves as the town banking and money exchange center and the clerk was knowledgeable, efficient and honest in changing my dollars to Peruvian Soles. It’s astounding to me, the role that vibrant color and high quality alpaca and llama products play in the everyday lives of the people. They wear oranges reds, yellows, greens and blues in happy profusion; just as they weave then into wall-hangings and carpet bags. Color and music give the heart quality of the Peruvian people away. Shy modesty, at first, could fool an observer; but there’s a sweet and innocent sparkle ready to break into a beaming smile with the least encouragement. My retreat is a $1.00 Tuk-tuk taxi ride from town, or a dusty hike. My modern, single, ensuite room costs $25 per night under my long-term arrangement. I can buy breakfast for $3 or dinner for $10, at the on-site restaurant; plus. there are many restaurants within walking distance; as well as a complete, fireplace-equipped kitchen/lounge where I can cook my own meals. I have come way up in the world from my usual $11 – $17 hostel bunk rooms, and I am ready for it. Paz y Luz conducts Yoga Retreats and week-long sessions on spiritual and healing subjects. Also available are massage and crystal work, cleansing and detoxification, plus San Pedro and Ayahuasca Ceremonies. In business since 2000, this Center attracts small groups from all over the world throughout the year. I get to plan my own routine, or simply bask in the beauty of the place; while privately recuperating from high altitude, chilly weather and hard traveling, writing and working in The Sacred Valley, so close to Machu Picchu.